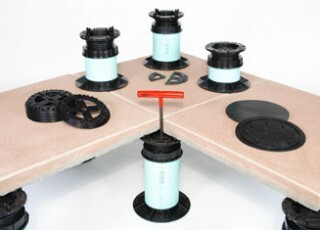 The pedestal paver system is specially designed to level over concrete or other heavy pavers. The system can free your space and have attractive yet functional roof pavers. Creating level surfaces for other applications, with the pedestal paver system, you can now use your space for energy-efficient solutions like the popular Green Roof. The system works by elevating a framework for your paving tiles, leveling the walking surface and yet properly spacing the pavers for good air flow and water drainage. Manufactured with modern techniques and uses fire-resistant recycled materials like ABS plastics, the pedestal paver system is very safe and is environment-friendly. The system has been tested for its load capacity, strength, durability and effectiveness. As new designs are developed continuously for addressing previous concerns, the system is constantly improved for the satisfaction of users. The round bottom shims have a “V” groove, which allows them to be scored and broken with a utility knife into either a half or a more usable shape and stacked on the bottom. They lock to each other and to the bottom cap to stop movement of the pedestal. Moreover, the weight of the paver tiles will keep the system in place. The top cap can be used on its own when the required height is less than an inch. The top cap is half an inch in height, it will need a 1/16 inch or 1/8 inch bottom shim locks into the bottom of the top cap. In some uses where an inch in height is needed, the top and bottom cap can be used with a default diameter PVC and 1/8 inch and 1/16 inch bottom shims. The 4-inch PVC used in the pedestal system is 3034, an off-the-shelf product with the outside dimension of 4.215 inches which is also the inside diameter of the top and bottom cap of the pedestal. The Pedestal Paver System is made for concrete pavers to lay level over a built up roof. The substrate material can either be a concrete or wooden structure, with the roof membrane on top. The PVC pipe with the pedestal system helps to vary its heights up to about 20 inches. The standard 1/8 inch spacer tab on the top cap is designed for a proper alignment of the pavers and an open joint.